Fishing on the Big Hole River has always been popular. This river is one of Montana's best, with a diversity that's hard to match. The Big Hole hosts rainbow, brown, cutthroat and brook trout. Rocky Mountain whitefish are also present, as well as the last fluvial (river-dwelling) population of grayling in the United States, outside of Alaska, of course. Much of the land bordering the Big Hole River is privately owned, so floating the river will let you cover the greatest amount of water. The Big Hole is fishable from its source down to its confluence with the Beaverhead. This river takes on many faces throughout its journey; from mountain stream, to meadow stream, tumbling through a canyon and then on to a broad slow-moving river meandering through farmland. 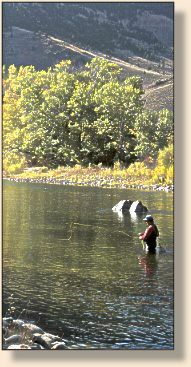 The Big Hole has a variety of water that can be fished using a variety of methods. The Montana Department of Fish, Wildlife and Parks manages the Big Hole fisheries in several segments, with slot limits, gear restrictions, and regulations suited, they believe, to best manage the fish in each segment. Settlers started arriving in the Big Hole Valley immediately after the Nez Perce battle, [The Battle of the Big Hole, and the Trail of Tears.] But before the settlers came, the Lewis and Clark Expeditions passed through the valley in early August, 1805. Having already named the Jefferson River after their President and expedition sponsor, the party reach what Captain Lewis described as the forks of the Jefferson. The explorers named the forks for President Jefferson's three cardinal virtues - Philosophy, Philanthropy, and Wisdom. 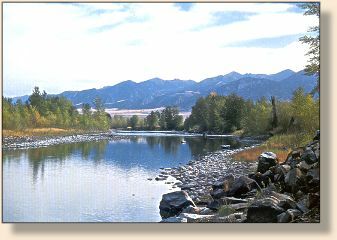 The first river eventually went back to its Indian name, Beaverhead. Philanthropy eventually became known as Stinking Water, and is now the Ruby River. The northerly fork which Lewis personally named Wisdom River is now known as the Big Hole. In the Journals of Lewis and Clark, they make mention of the low water level of the Big Hole, and the difficulty of navigation by boat. On Saturday, August 3rd, 1805, a passage read, "The men were so much fortiegued today that they wished much that navigation was at an end that they might go by land." The Shoshone Indians knew the Big Hole Valley as Ground Squirrel Valley, and the land of Big Snows. Lewis and Clark called it Hot Springs Valley. Later it was to become known as the Valley of 10,000 Haystacks. It was the trappers who probably came up with the name "Big Hole" by describing the valley it drains. Angling has always been a draw to the Big Hole. Dewey Flats was once a destination for fishermen from Butte, which was a long day's ride by horseback. Today the Big Hole hosts visitors from all over the country. 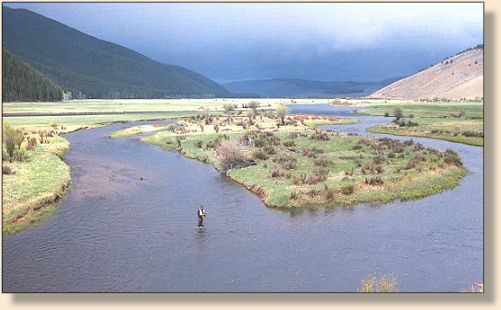 The 'Hole,' as it is known by those who frequent it, is a blue ribbon fishery, one of Montana's finest. The Big Hole is a river in which fishing is very much influenced by the seasons. Fluctuation in water flow, and consequently high water temperatures, is the key reason the fishing drops off and this can be attributed to a variety of reasons . . . Water flow information is available from the USGS in Helena (406) 449-5263. The gauging station is located between Melrose and Glen, and when planning a float trip down the Big Hole it is a good idea to call first . . . Records show that the average flow of the Big Hole over a 64 year period was 1,162 cfs. Winters in the Big Hole Valley can be quite severe. Temperatures are often brutal, dropping well below zero. When the upper river begins to thaw in spring, good fishing is not far off. 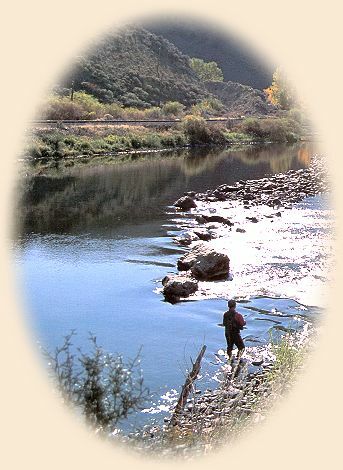 In fact, you can fish much of the river whenever there is open water. During early spring the water level on the 'Hole' will normally be low. Not like summertime lows, but low nonetheless. March will see a slight rise in the river, but it isn't until April and May that there is a significant increase in volume due to snow melt. Fishing during this time can be interesting. 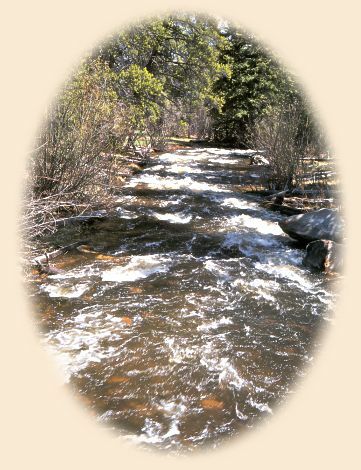 The upper river and its tributaries are good places to focus your attention, while there is ample water to fish them. It is also a time when you see few anglers on the river. Hatches will be in full-swing by late April and May. The floating angler should pay special attention to the banks, foam lines and structure, making a point to anchor or get out and fish these areas thoroughly. Caddis and mayfly hatches can produce top-water feeding frenzies that trigger hot action to those who happen to be on the water when its going on. Nearly any caddis pattern properly presented this time of year in this stretch of river is a safe bet. 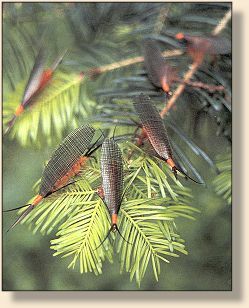 During a normal year, with normal snow-melt and runoff, the salmonfly hatch will begin early to mid-June. Anglers descend upon the Big Hole in masses to take part in the frenzy. This is the busiest time of year on the 'Hole,' and the river can become quite crowded with boats as well as bank anglers. Outfitters from all over the state guide the Big Hole during the salmonfly hatch, and, their presence, although legal, is quite the controversy among local guides. After the salmonfly hatch, fishing pressure on the 'Hole' drops dramatically, even though angling is still very good . . . caddis and mayfly hatches are abundant, and are pretty much widespread throughout the entire river. June sees a major change in the flow of the river. Irrigation demand is heavy and, with the watershed drying up by late June like it has for the past several years, the flow of the 'Hole' is greatly reduced, on average, from its peak of around 4,200 cfs at the first of the month, down to around 1,200 cfs by the end of June. Early summer fishing is good though. Caddis are the predominate hatch, with some smaller stoneflies and again, a variety of mayflies. It is wise to remember that there are some real monsters in this river and the light tippets that produce 'the most' strikes will most likely fail if you hook a true pig. It's a bit of a trade-off; light tippet, dry fly - lot of fish or heavy tippet, big streamer - and maybe a trophy. It's a tough call sometimes, especially when you snap a large fish off that rose to your fly. What I like to do, especially when floating, is to have two rods rigged, one with a floating line and dry fly, the other with a big nymph or streamer. That way I can fish the water more thoroughly and up my odds of hooking Mr. Big. Traditionally, fall is my favorite time on the water. And the Big Hole has been good to me in the fall. The period of time in fall when night temperatures have cooled the water down enough to make fish active again, all the way to ice-up can be a productive time for monster hunting. In fall, Baetis mayflies can be important during hatches, which occur during the warmest part of the day. A tiny, number 18 or 20 BWO or Black Baetis can take a surprising number of fish if you find an area where a good hatch is coming off. Watch along the banks close to good holding water. Trout move to the edge of the faster current and sip in the small mayflies right on the current seam. Takes are often very subtle, so keep a close watch on your fly and leader. You can find good Baetis beds along the entire river system. 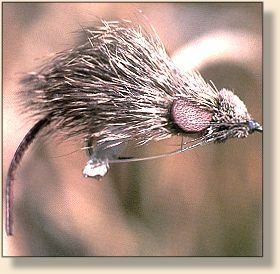 I prefer to fish the canyon stretch near Divide when the Baetis are on, and during the periods when nothing is hatching, I will bounce a nymph along the bottom through the deeper water with hopes it will find its way into the mouth of a big brown. As the water temperatures cool down below the 40 degree mark, trout will be harder to make contact with and whitefish hookups will be more frequent. For most fishing on the Big Hole an eight to nine foot, four or five-weight rod is a good choice. The exception would be when fishing large streamers down deep for the large browns which are found in the river. For this a six or seven-weight system would be the wiser choice, keeping in mind that some of the browns can exceed 10 pounds. Even though western Montana has been caught in the grips of an extended drought for several years now, expect extremes in weather when visiting here, and come prepared. During summer it can be dreadfully hot, but thunderstorms can rattle through with little warning, so rain gear is important baggage on your float even if you leave under clear blue skies. I know, I've been soaked more than once while on this river! Spring and fall can host cold weather whenever a front comes through. Keep in mind that the Big Hole flows from over 7,000 feet down to an elevation of 4,600 feet. Take a jacket along just in case! The Big Hole is many things to many people. To me, it is one of Montana's finest trout streams and that is why I keep going back. But besides fishing, the area offers kayaking, hunting, rock-hounding, gold panning, as well as rock climbing in the Humbug Spires. Wildlife along the Big Hole is abundant, with large populations of deer, elk and antelope. Black bears are common in the upper valley, but there is no grizzly habitat. One of the largest winter ranges for moose in Montana is between Wisdom and Ralston. For a MAP of the Big Hole River, click here. For the FLIES for the Big Hole River click here. 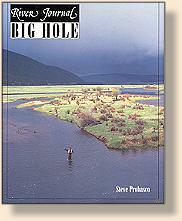 To ORDER Big Hole River direct from the publisher, click HERE. Credits: From the Big Hole River, part of the River Journal series, published by Frank Amato Publications. We greatly appreciate use permission.